Though Western-inspired pop culture didn’t arrive in Russia until after the fall of the USSR, hip-hop culture there was hardly a Nineties thing: a deeper dive into dance culture reveals that Soviet b-boys were familiar with locking, popping and robot-ing as early as the mid-1980s. There were movies and festivals dedicated to breakdance, which was originally invented in the Bronx in the 70s. Pirated copies of groundbreaking breakdance movies such as Breakin’ were spreading among Soviet youth, introducing them to a whole new way of moving and — eventually — living. There’s hardly a better portrayal of the mid-80s breakdance movement in the USSR than the 1985 movie Dancing on the Roof, which centres around a bored teenager and his adventures around Moscow during summer break. Though the film isn’t entirely about dance in spite of its title, the protagonist does at one point come face-to-face with some colourful breakdancers. That scene served as an introduction to a whole new dance genre for Soviet viewers. The movie features a cameo from then-emerging pop singer Laima Vaykule, and can be found on YouTube. 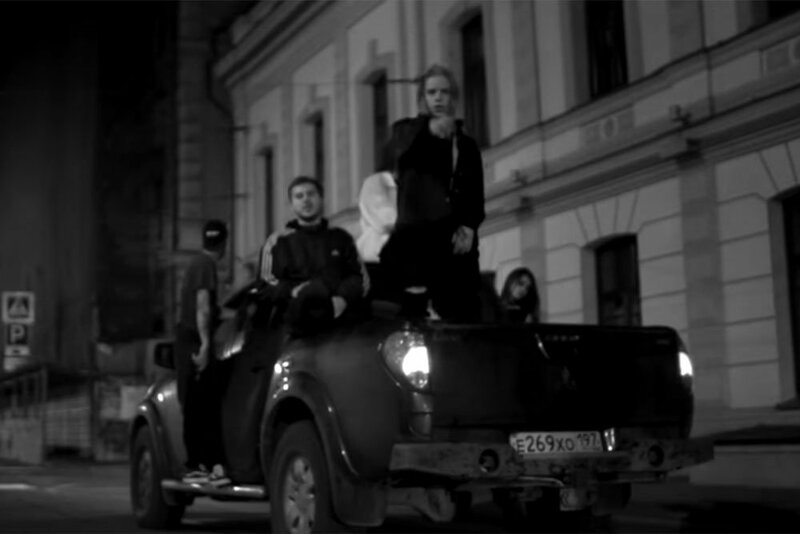 Director Viktor Volkov’s next film, Article (1988), also featured a breakdance scene shot in the cult b-boys-approved venue Moloko. Volkov went on to disserct teen culture with 1991’s Show-boy, which told a tragic love story between a member of a boyband and a prostitute. Another example of breakdancing’s existence in the USSR appears in what can be described a Soviet take on the coming-of-age genre, 1986’s Courier (also known as Deliveryman). The film, directed by the renowned Karen Shakhnazarov, told a story of a savvy teenage deliveryman named Ivan and gave a rare insight into what it was like being young and rebellious during perestroika. 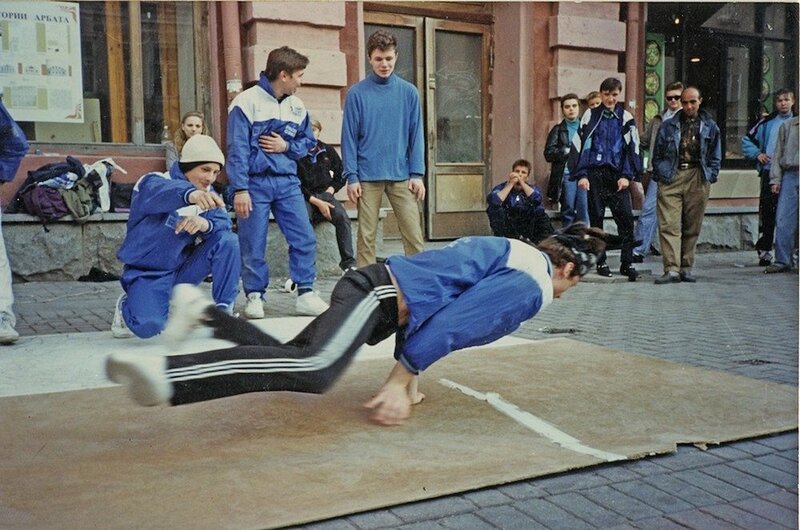 The several scenes that feature breakdancing (including some quite impressive floorwork) served as a free dancing master-class for anyone who couldn’t attend the first ever breakdance lessons at Moscow’s “Pravda” Palace of Culture. Each neighbourhood in Russia had its own spin on the moves, vibe and flow. 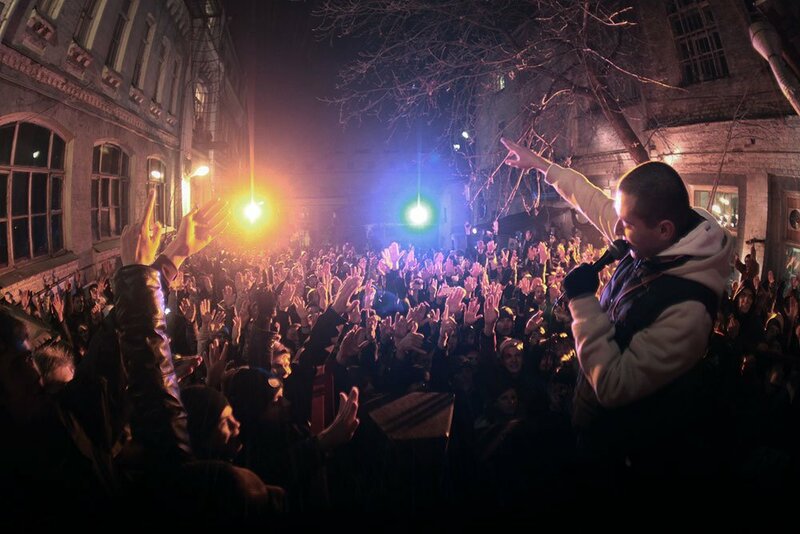 With no festivals to showcase their skills, dancers simply picked the busiest street in the capital to flaunt their techniques and flashy outfits, purchased from the passing-by foreigners (such clothes was dubbed “utyuzhgka” — literally “ironed clothes”). The street in question was Arbat, which to this day remains one of the most eclectic culture-clashing sites in Moscow, where you can find a Starbucks, souvenir shops, pet sellers, DIY musicians and a wide array of care-free alcohol-inspired individuals. 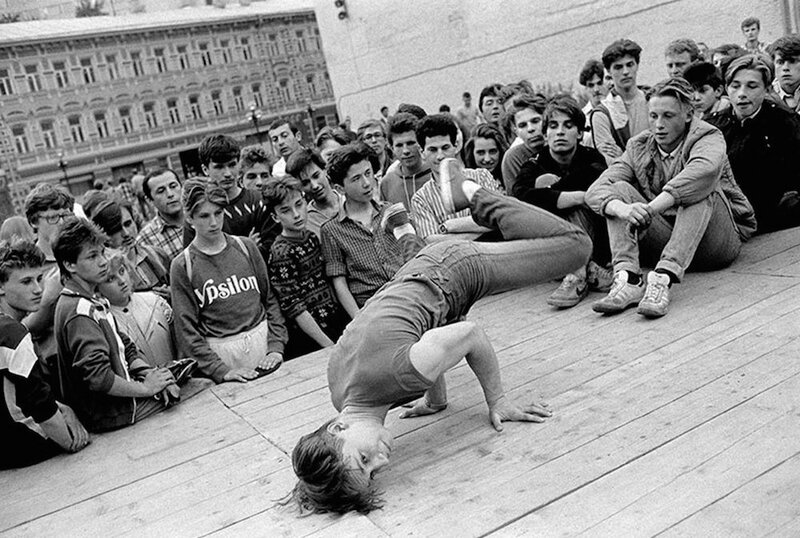 But police had little influence on Soviet youth and in 1986 Arbat became the go-to destination for the first ever generation of Moscow b-boys. Hundreds of people watched dancers spin on the ground, and tried and replicate the moves. 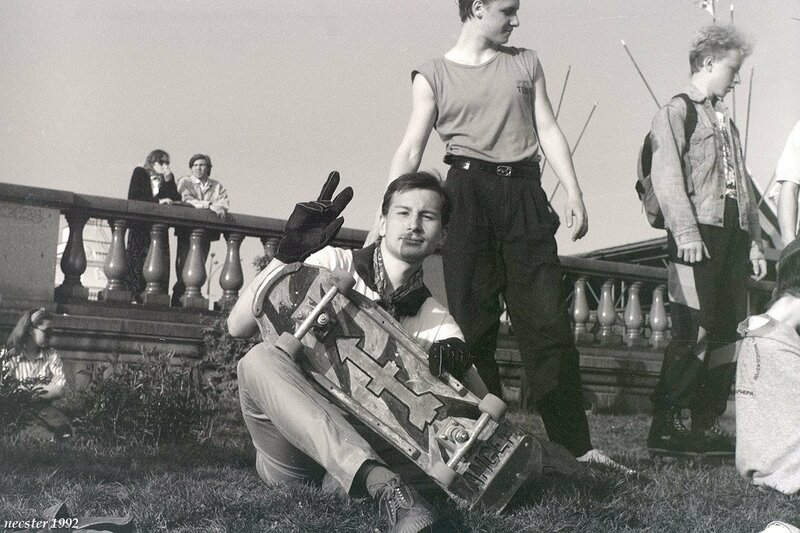 For the Moscow youth of the 80s, Arbat was the place to be, much like the steps of Zvetnoy market became a cult meeting spot for the teens of the 2010s. These days you’re more likely to find buskers and street artists on Arbat hoping to score a passing tourist’s change. However, back in the 80s breakdancers weren’t worrying about the money: it was more about joining the movement, the party and the epic dance battles. But making money also provided an opportunity to buy a train ticket to Lithuania and perform at the local dance festival there. One of the very first USSR breakdance festivals was organised in 1986 in the Lithuanian resort town of Palanga. The festival was titled “Papuga-86” (papuga means “parrot” in Lithuanian) and became an annual event, with similar festivals popping-up across the Soviet Union. Soon, b-boys would be setting off to places like Tallinn, Riga, Vilnius and Vitebsk to join the international party and participate in battles. A fun fact: “Papuga” was where several aspiring dancers met choreographer Alla Duhova, later going on to start “Todes” together, arguably the most famous dance company in Russia. The collapse of the Soviet Union allowed Western culture to crash onto the newly-developing market like a tsunami, yet Russian breakdancers still had to fight for their right to party. The arrival of all-dancing all-singing hip-hop collective Da Boogie Crew in the mid-90s took breakdance culture into the mainstream and started the second wave of breakdancing hype. Arbat remained the meeting point for dancers and even got its own breakdance guardian angel in the form of local old lady Zora Mikhailovna, who would allow the dancers to store their bags and equipment in her Arbat apartment. In return, b-boys would pay her a small fee and turn her into an extra Da Boogie Crew member, sampling her voice in their tracks and inviting her to their performances. Hip-hop culture is clearly here to stay, with TV dance competitions attracting millions of viewers, numerous well-organised dance competitions and the ongoing flood of Russian-born rappers to providing a topical soundtrack. Just this past December breakdancers from all the different “waves” and eras reunited for a big celebration on a boat-turned-hangout-spot Brusov in Moscow to celebrate the 30th anniversary of Soviet breakdance. With hip-hop culture stronger than ever, this was a nice moment to recall where it all began. Or just bust a couple of moves.